We’ve found a new way to entertain Alex while inside: Cook. Molly pioneered this technique with waffles last weekend. This weekend, Alex and Molly made pancakes. Alex also likes to sit in his chair while I chop vegetables for dinner. He likes having jobs to do, and when I chop his job is to put the scraps in the trash. When he’s making breakfast with Molly, he likes to stir. I guess it’s more accurate to say: Molly lets him stir. He also likes to crack the eggs, turn on the mixer, and lick the batter. But what we let him do is whisk. 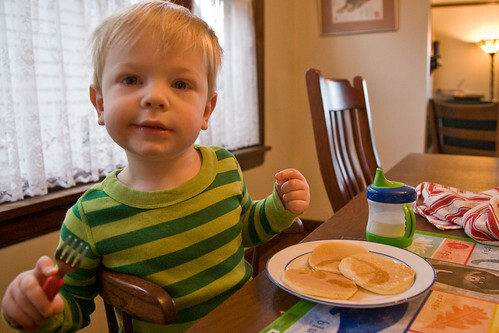 And finally, Alex got to eat the pancakes. Believe me, he knows the word syrup!